THE TOURNAMENT HAS SOLD OUT! We are now accepting names for our waiting list for golf. Sponsorship for Golf Holes are still available. Markland Wood will once again be the location for the 2019 OIRCA Annual Golf tournament. The tournament sells out quickly, so get your registration in early. Each registration will receive confirmation from our office acknowledging your registration (if you do not receive an acknowledgement, please contact the office). or contact the Association office to order hard copies. The 2019 OIRCA Annual General Meeting (AGM) is scheduled for Thursday, January 17, 2019. The venue will once again be the Old Mill in Toronto. The 2019 AGM will be structured same as last year with Active Member only sessions in the morning.. This meeting will be addressing the 2018 Membership Survey and Strategic Planning. Following the morning meeting is the Awards Luncheon with the AGM in the afternoon. All members are welcome to attend both. Active Members are encouraged to make every effort to attend the Special General Meeting with the representative in attendance having the authority to vote on behalf of the company. John McLaughlin, Beacon's President for Northeast & Canada recently announced the appointment of Charles Michaud as Vice President of Canada in the Northeast/Canada Division. Charles will be responsible for leading the company's overall growth strategy in the country. Mr. McLaughlin also announced the appointment of Laszlo Tatarasanu as Regional Vice President of Operations; he will report to Mr. Michaud. Interim President Louis Zammit will conclude his role in that capacity but will remain to support the Canada management team on a scaled backed basis. Peter Vi – IHSA, Enzo Garritano – President IHSA, Don Marks – OIRCA, Peter McGoey – Semple Gooder Roofing, Barry Warner – Covertite Roofing and Joe Manso – Local 30 Roofers. 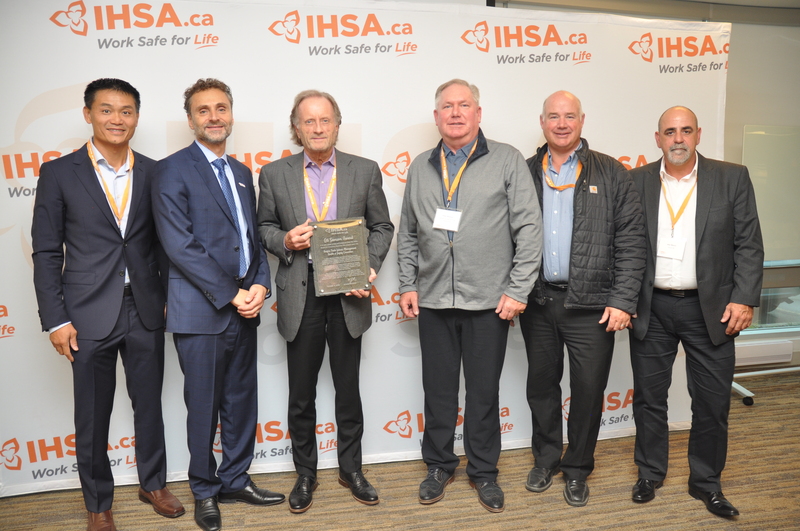 The Infrastructure Health and Safety Association has presented their 2018 Gil Sampson Award to the Roofers’ Trade Labour-Management Health and Safety Committee. The Gil Samson Award honours a Labour-Management Committee that has contributed to the advancement of occupational health and safety by virtue of a program, publication, or other accomplishment. IHSA applauds the Roofer’s LMHSC for their contribution to the Ontario Electrical Safety Code (OESC) changes as they relate to requirements for cables and raceways installed in metal corrugated roof decking, and for their development of a new Safe Practices for the Working On or Around Photovoltaic Systems Manual that provides guidance for workers, supervisors, employers, and designers who install, maintain, or work near rooftop solar panels. OIRCA rescues another Roof; this time in Toronto! In 2017 the OIRCA launched the OIRCA Rooftop Rescue Foundation (RR). The Foundation’s mission to provide roofing services to individuals and organizations that are deemed worthy and unable to fund roofing construction on their own. The first project completed by Rooftop Rescue was for the Scottish Rite Charitable Foundation Learning Centre for Hamilton. Their mission to assist children with learning disabilities. When RR received a submission from Covenant House Toronto the notion of helping youth again in 2018 was a good fit. As Canada’s largest agency serving at-risk, homeless and trafficked youth, the opportunity to help with a newly acquired property in Toronto was an easy decision for the RR Foundation Board of Directors. Covenant House Toronto’s new facility is a residential property with a combination of steep-sloped shingle roofs and low-slope flat roofs. OIRCA Active Member Atlas-Apex Roofing Inc. of Toronto generously volunteered to provide the labour, design services, miscellaneous roofing materials required and the expertise to tackle a tight downtown residential job site. The complexity relating to the site set-up necessitated a scaffolding solution which was graciously donated by Northstar Scaffolding. Beacon Roofing Supply Canada Company of Concord, an OIRCA Associate Member stepped forward and supplied all roofing materials including shingles, underlayment, insulation, low-slope modified bitumen roofing membranes and other roofing accessory materials. Nusens Niche Contracting, an OIRCA Affiliated Contractor Member, was a late addition to the party when at the last minute it was discovered that the masonry parapet walls required rebuilding, they dropped everything and were on site almost immediately. The Infrastructure Health & Safety Association (IHSA) has released a manual titled Safe Work Practices for Working On or Around Photovoltaic Systems: A Health and Safety Guideline for Workers, Supervisors, Employers and Designers. The manual was developed, reviewed, and endorsed by the Photovoltaic Subcommittee of the Roofers Trade Labour-Management Health and Safety Committee in association with the IHSA. The Photovoltaic Subcommittee was established to address health and safety concerns for workers who are working on and in proximity to photovoltaic generation systems. The committee identified a need to educate workers and employers about workplace hazards associated with photovoltaic installations. The event also raised $2,300.00 for the OIRCA RoofTop Rescue Foundation. The OIRCA Board of Directors is pleased to announce that Mr. Tony Pocobene owner of Atlantic Roofers Ontario Ltd. of Hamilton has been appointed 2nd Vice President effective immediately. The OIRCA Board of Directors is pleased to announce that the 2018 OIRCA Award of Merit has been posthumously awarded to Mr. Frank Baxter the former owner of Semple Gooder Roofing Corporation. The Association introduced this Membership Award a few years ago to recognize an individual from a member company who has made a significant contribution to the OIRCA or the greater roofing industry in this province. Frank’s service to the Association and our industry spanned a period of just over 10 years. He served on the Membership Committee from 1997 to 2005 and the Board of Directors from 2001 to 2007. Frank also played an important role on the Labour Relations Committee from 2001 to 2007 where he participated in three rounds of negotiations with the union (as a part of the OIRCA Negotiations Committee). Finally he served on a number of ad-hoc committees including the Insurance Committee that successfully developed a liability insurance program for the membership. Frank Baxter was a leader in all aspects of his participation with the OIRCA. His strong voice and passion for our industry helped shape the roofing business we enjoy today. His presence is sadly missed. 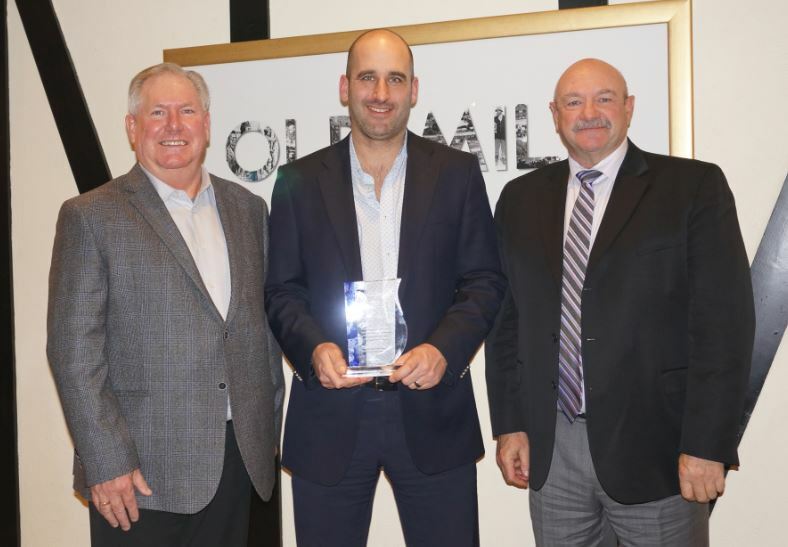 The award was presented at the Association’s Annual General Meeting Awards Luncheonn Thursday, January 18, 2018 at the Old Mill in Toronto. Mark Baxter (centre), Frank’s son, accepted the award on his behalf. Also with Mark, Semple Gooder Vice Presidents Peter McGoey (left) and Bill Gray. Left to Right: Simon Fenn (CEO), Danielle Fenn (President) and Tara Klein (Business Development Specialist). Industry Member Fenn & Fenn Insurance Practice Inc. who administers the OIRCA Liability Insurance Program recently dropped by the Association office with a cheque for Rooftop Rescue in the amount of $2,428.00. Fenn & Fenn had collected donations from their OIRCA Program team including themselves, MS Amlin (Mitsui Sumitumo Insurance; Lloyds Syndicate) and CJ Coleman (Fenn’s London Broker). Their fund-raising included the donation of the Grand Prize of a 65-inch television for our recent annual golf tournament. OIRCA and Rooftop Rescue appreciate the Fenn’s support of our programs, activities and initiatives. While making his final speech to the membership at the January 2017 Annual General Meeting, John Petrachek of Atlas-Apex Roofing… now Past President announced that his goal to establish a charitable foundation for the Association will become a reality in 2017. The foundation, ultimately named the OIRCA Rooftop Rescue Foundation, was formed earlier this year with the establishment of a Board of Directors, creation of a logo and launching of a website. While still early days for the charity and with a few details still to be worked out we are pleased to announce to the membership that the first roofing project for the Foundation was substantially completed last month in Hamilton. We received a letter of inquiry from the Scottish Rite Charitable Foundation Learning Centre for Hamilton. The establishment of their learning centre will provide free remedial tutoring for children with dyslexia in the Hamilton area. The Foundation Board reviewed their submission and decided their need would be a good opportunity for us to get our feet wet with our first roofing project. Their facility is a residential property with a steep-sloped shingle roof and a small flat roof. Semple Gooder Roofing Corporation of Toronto graciously volunteered to provide the labour, design services and miscellaneous roofing materials required. Convoy Supply stepped up and supplied shingles, modified bitumen membrane and other roofing accessory materials. Dave Walden former owner of OIRCA Member Company Conestoga Roofing served as our Project Manager for the work. The fall issue of Ontario Roofing News will include a cover story providing the full story about this worthwhile Foundation project. We just wanted to let the membership know that we have moved forward with this initiative and hope that this is just the first of many more meaningful projects that the Association and its Membership will support. 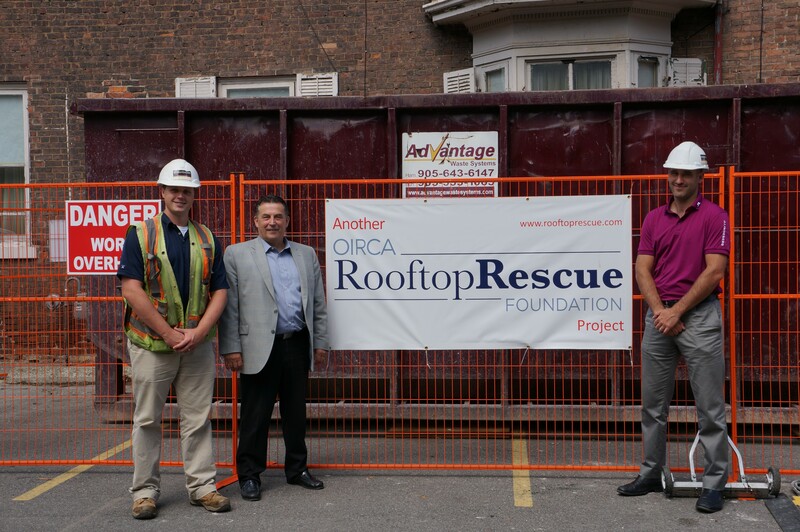 The Ontario Industrial Roofing Contractors Association (OIRCA) has launched a charitable foundation aptly named Rooftop Rescue. The Foundation's mission is to provide roofing services to individuals and organizations that are deemed worthy and unable to fund roofing construction on their own. For more information visit the Rooftop Rescue website at www.rooftoprescue.com. Mark Clemmensen, RSW, B. Arch Sc., LEED AP and Specification Writer for AECOM Canada Ltd. tells why he specifies OIRCA. Click here to find out why. 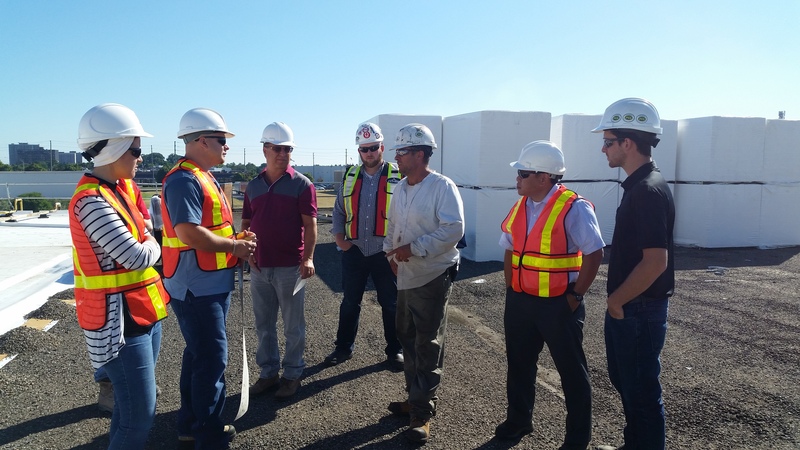 OIRCA’s first ever Architectural on-site Roofing Tour was held on July 26th with great success. Feedback from attendees was extremely positive with interest in attending future tours. The purpose of this endeavor was to bridge the gap between the design community and our Roofing Contractors; allowing Designers to gain firsthand experience on how roofing is actually installed on site. The attendees learned about different roofing systems while talking to the roofing professionals who make it all happen. Some attendees even had the opportunity to try heat welding a single ply membrane for the first time. A big thank you to Flynn Canada for demonstrating a single-ply TPO installation while being extremely courteous to our group, Dufferin Roofing for demonstrating a BUR installation and Semple Gooder Roofing for providing a detailed walk through of their picture perfect Modified Bitumen/Green Roof work done on the Yorkdale Shopping Centre. Also to Peel District School Board who arranged to have our group visit the re-roofing of one of their schools. Given the success of this venture we will be looking to hold similar on-site tours in the near future. Stay Tuned! The OIRCA has introduced a Q & A Forum on their Achitectural Documents wepage. The Design forum’s purpose is meant to be used as an ICI (Industrial, Commercial, Institutional) Roofing source of information. 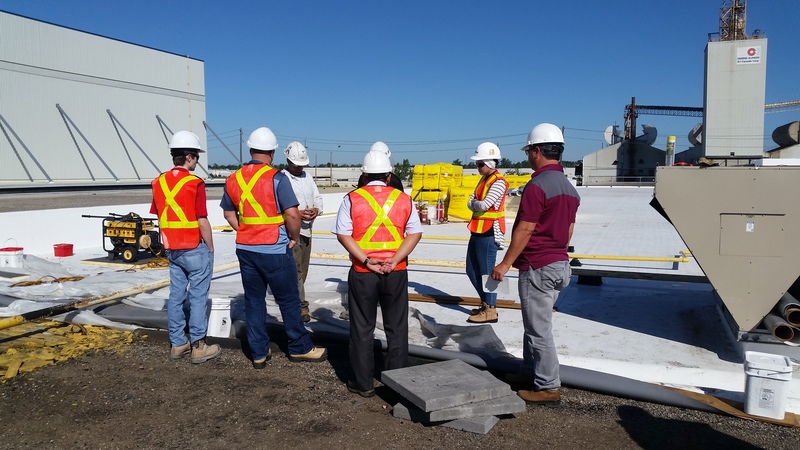 We encourage people from the design community as well as procurers of ICI roofing in Ontario to use this Q & A Forum as your go to resource for roofing related questions. As we cannot comment on product specific questions due to warranty requirements, we ask that you keep your questions generic. The Architectural Documents page may be accessed on the silver menu bar. 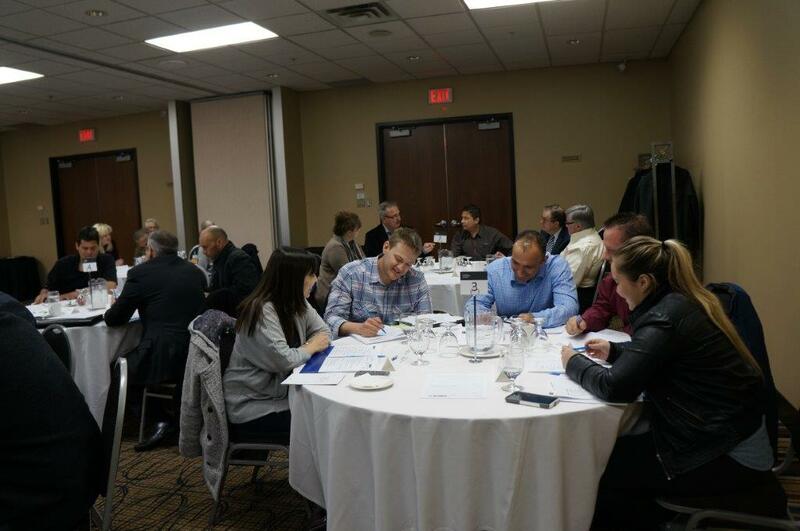 On March 26, 2015 the OIRCA hosted their first Risk Mangement Symposium/Workshop at the Toronto Congress Centre. Sponsored by OIRCA's insurance partners Mitsui Sumitomo Insurance Group and Cooper Gay & Co. Ltd. both of London England, the event was a major success with 40 members in attendance. The morning included presentations by Mr. David Dexter of Mitsui and Mr. Tom Shanahan from the US's National Roofing Contractors Association. The afternoon workshop was hands-on, interactive and professionally facilitated by Mr. Warren Wilson of the Intersol Group. The OIRCA in conjunction with the Roofers Labour-Management Health & Safety Committee of the Infrastructure Health & Safety Association has released a new 76 page roofing safety manual titled, Low-Slope Roofing, Health & Safety Manual. 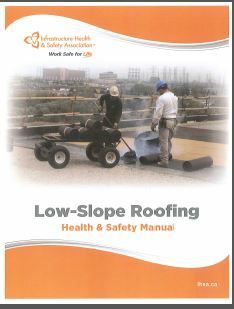 This manual replaces the previous version, Health & Safety Guidelines for Low-Slope Roofing. To download a free copy, click the Safety tab at the top of this webpage.